Indian jewellery industry has witnessed a rapid transformation during the past few years especially in luxury jewellery retail market which is expected to gear up its current share of 4 per cent to 18 per cent of the total retail sales by 2010. The gem and diamond industry contributes around 15-17 per cent of India’s total exports. Increasing disposable income and brand consciousness among Indians has futher given a boost to the luxury jewellery retail industry in India. Earlier, jewellery was considered to be an investment and was most of the time kept in lockers. However, with the emergence of working women concept, people prefer buying jewellery which is light in weight and can be worn on regular basis. This trend has led to increase in the sale of diamond jewellery as it is not just beautiful but also light in weight and easy to wear. Another reason contributing to growth the of luxury diamond jewellery is the increasing gold price. It is gradually ticketing too high in the market, enticing the customers towards diamond jewellery, as now there is a thin line in the price of gold and diamond. Last few years are considered to be the years of retail innovation and it has widened the flood gates for national and international brands to solidify their stands in the Indian market luring the customers with creativity and innovation. Entry of the luxury branded jewellery like Tiffany & Co., The Gem Palace, Harry Winston, Dia, Caratti, Ganjam, Mirari Jewels, Opulence By Jewelex, Alpana Gujral and Anmol Jewellery to name a few, have made a new market mantra which suits the needs and wallets of the upper middle class and high net worth individuals. The companies dealing in diamonds are following a new strategy of blending their products with Indian customs and traditions which gives a boost to sales and brand promotion. With the upsurge of the foreign players’ entry into India the branded diamond jewellery is getting established and is making its own identity in the market, creating a move from lower to medium range of product-line, i.e., daily wear or light weight jewellery. Considering increased competition as a result of entry of large number of foreign players in luxury jewellery retail, domestic brands are also converting and upgrading them from the mass to class luxury retail. Recognising the potential of the emerging luxury jewellery market, large numbers of players are venturing into this gem and jewellery retail sector. Also, franchising is likely to be one of the credible business models among the retailers. There are brands like Gitanjali, Orra, Cygnus and Tanishq who have already successfully expanded through franchise route. 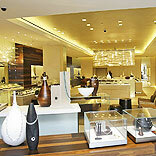 Reliance Jewel has an aggressive plan to open over 300 stores in 5 years across the nation. Swarovski also aims to add over 25 outlets by the end of 2009. Future Group-owned Navras is also foreseeing to have around 100 in-stores in Big Bazaar by 2011. Darpan Gupta, Owner, Mangatrai, a Hyderabad-based company admits to expand to towns to sustain in the market, However, the big players still cherish a mindset to expand their retail chains in the metros. He says, despite having the potential of the customers of tier I or II cities to buy luxury jewellery, they end up purchasing the merchandise from the main metros.